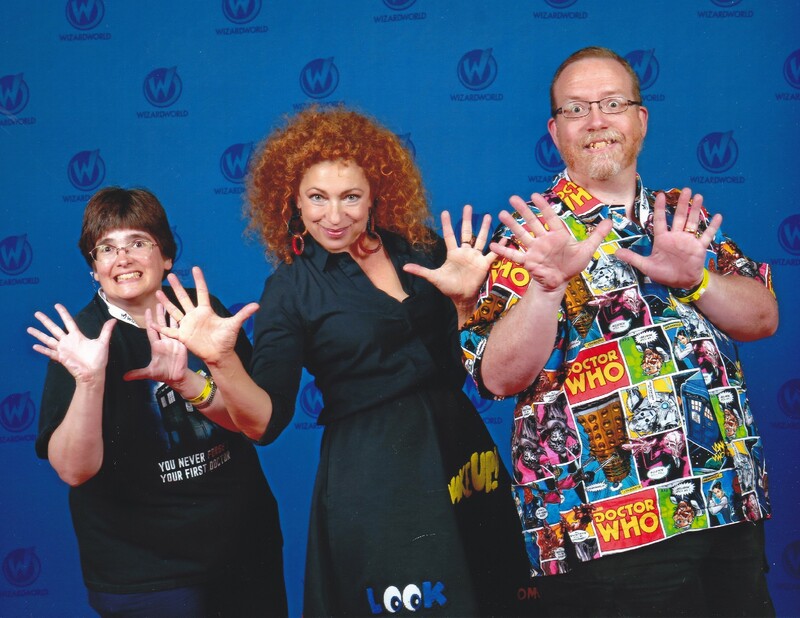 Our 2017 in Jazz Hands: Another MCC Convention Photo-Op Gallery « Midlife Crisis Crossover! 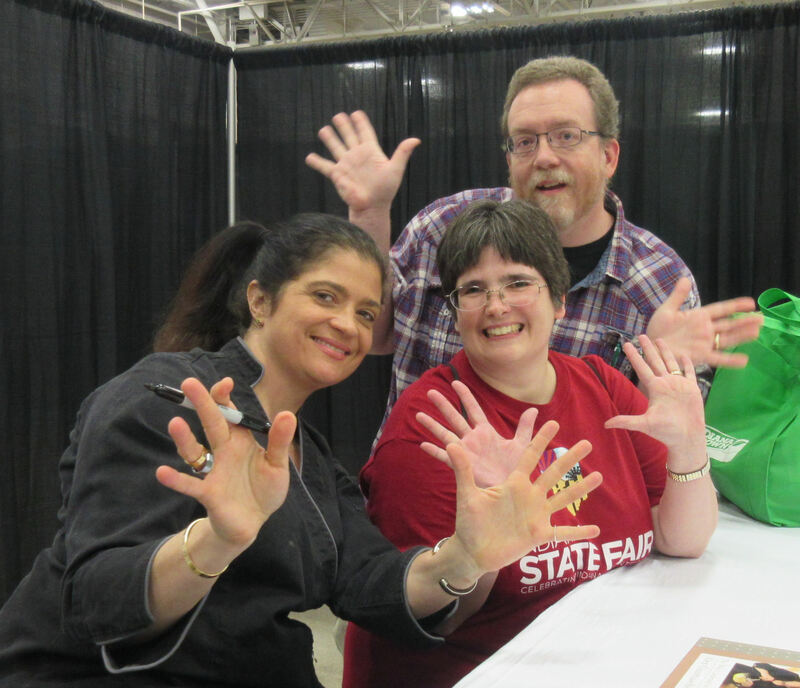 At the second annual Fantastic Food Fest here in Indianapolis: Iron Chef and Chopped judge Alex Guarnaschelli. In a bit of amazing cosmic timing, she’d made a joke about jazz hands in her Q&A before we even had the chance to approach her. Frank Conniff and Trace Beaulieu, a.k.a. 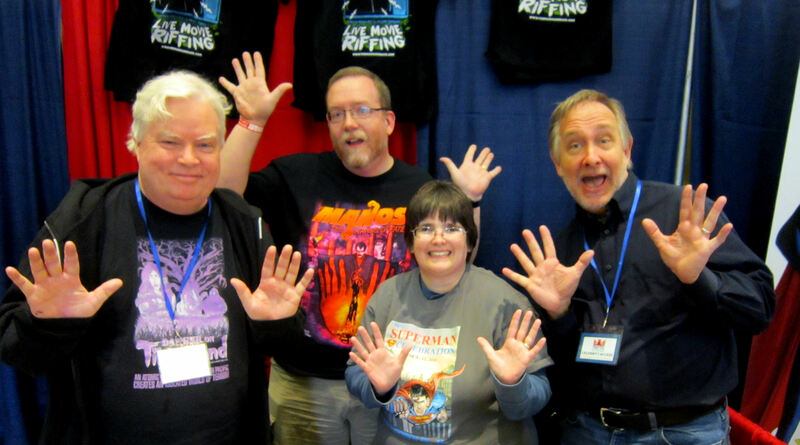 TV’s Frank and Dr. Clayton Forrester from Mystery Science Theater 3000 at the inaugural Hall of Heroes Comic Con in Elkhart, IN. Mike Colter, a.k.a. 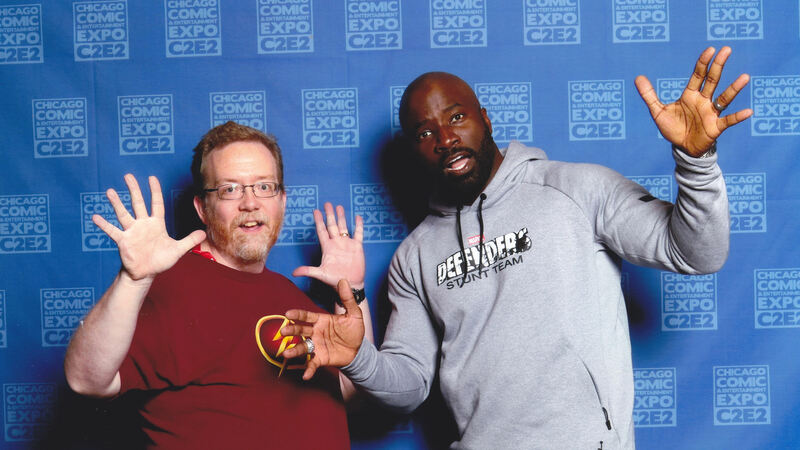 TV’s Luke Cage, hanging out at C2E2 in Chicago. Fun useless trivia: this was my most re-pinned Pinterest pic of 2017. 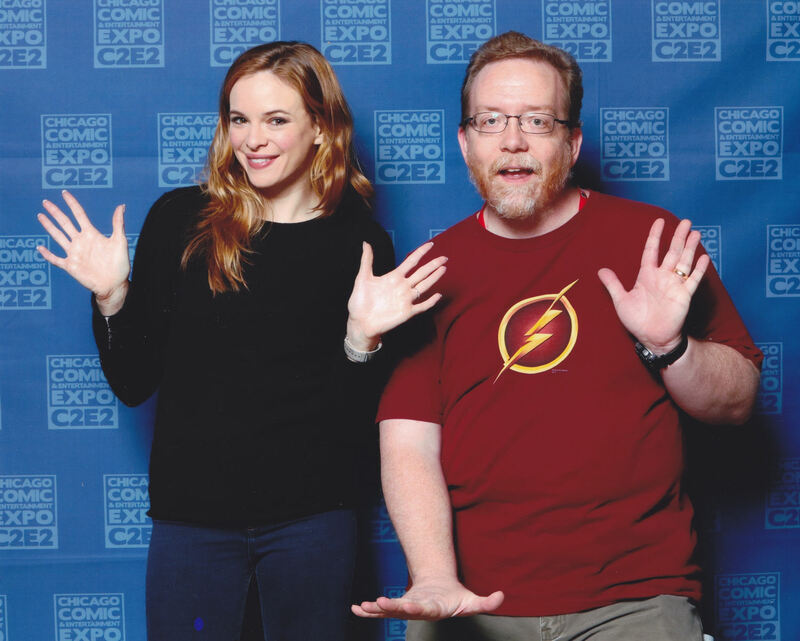 Also at C2E2: Danielle Panabaker from The CW’s The Flash, far less dangerous in person. 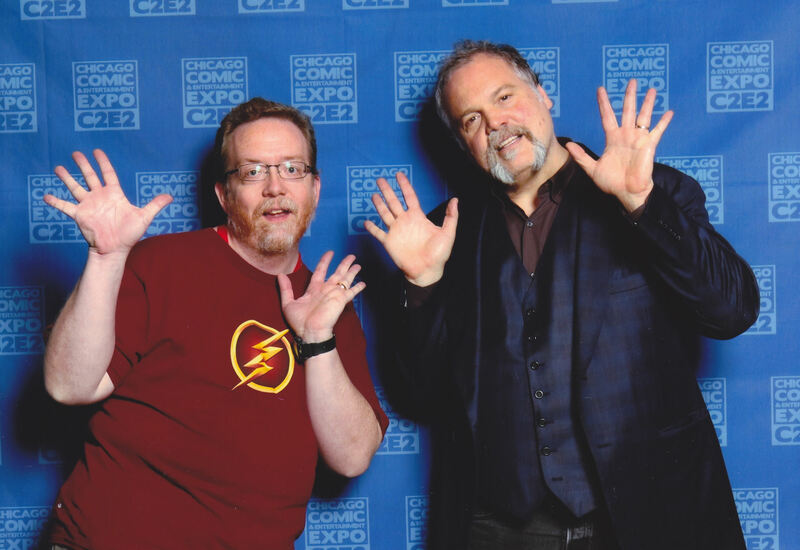 One of my main reasons for attending C2E2: the Vincent D’Onofrio, who was feeling really, really mellow that morning. 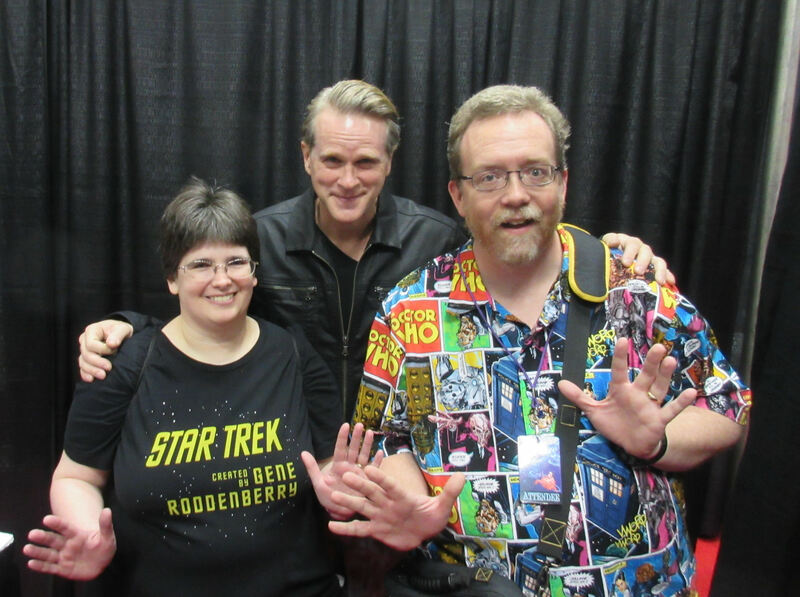 From our own Indiana Comic Con: perfect gentleman Cary Elwes humors a pair of goofballs. 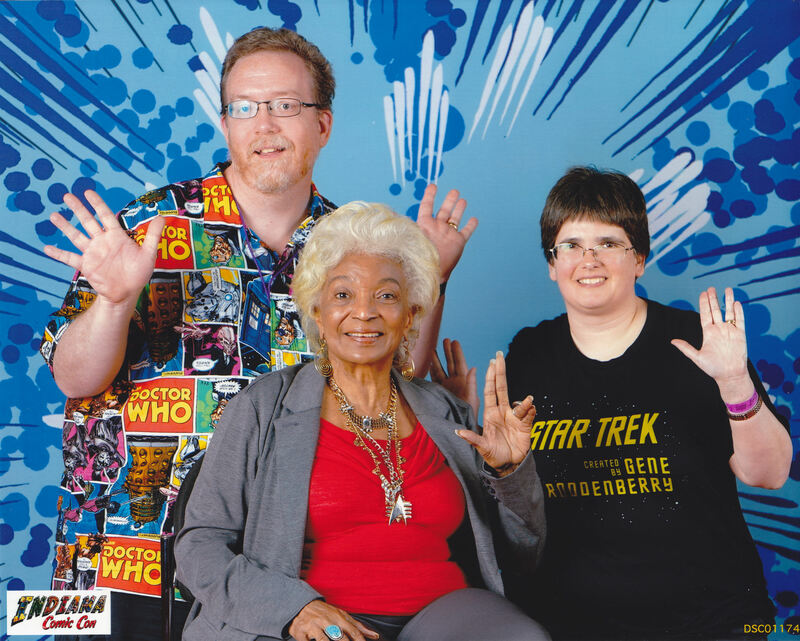 Also at Indiana Comic Con, one of those awkward moments of compromise: Nichelle Nichols has her world-famous hand gesture of choice, and we respected that. Technically. 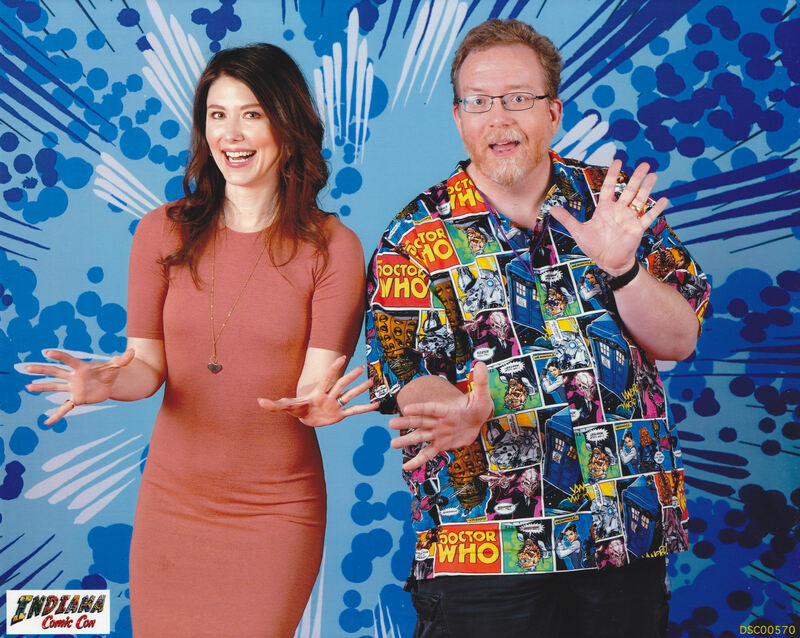 Meanwhile in a different galaxy at ICC, Jewel Staite from Firefly was game. 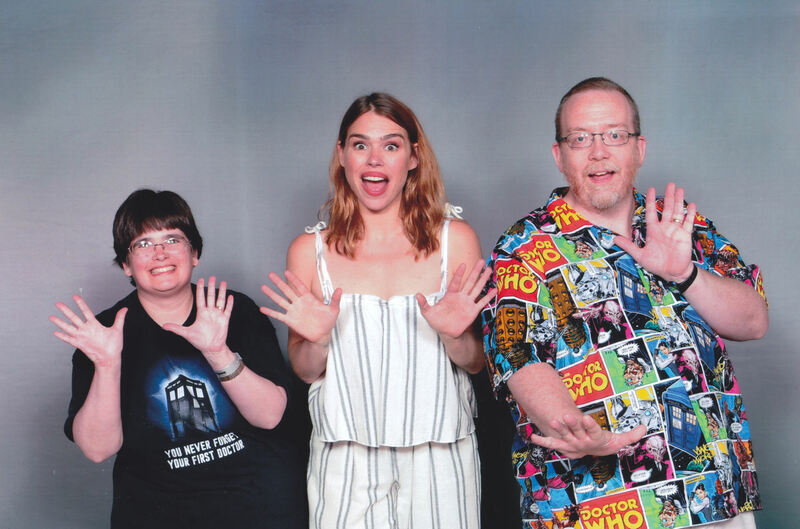 From our first trip to Motor City Comic Con, another Doctor Who veteran — the rather exciteble Billie Piper, also from the late Penny Dreadful. 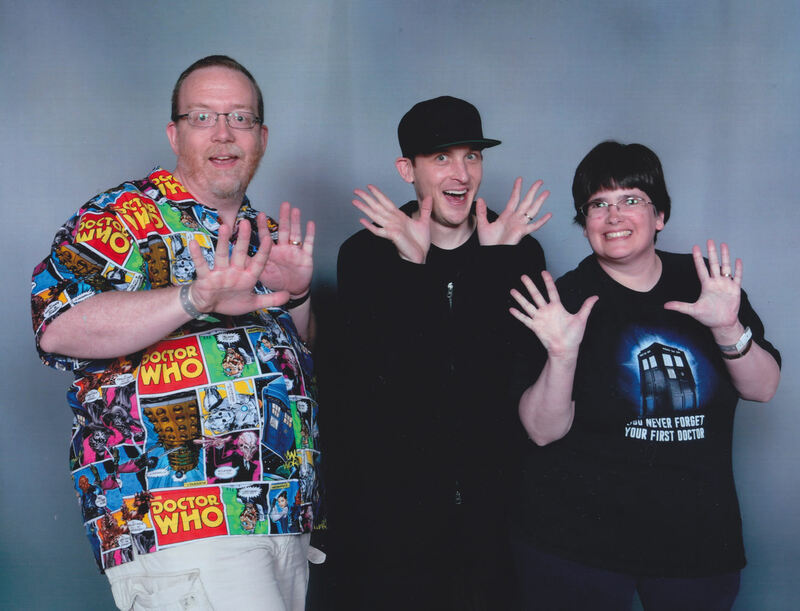 Later at MCCC, there was Gotham MVP Robin Lord Taylor. Thanks to a happy printing accident, we have a spare copy of this photo that’s up in my work cubicle. A nice everyday reminder of who we are and what we do. 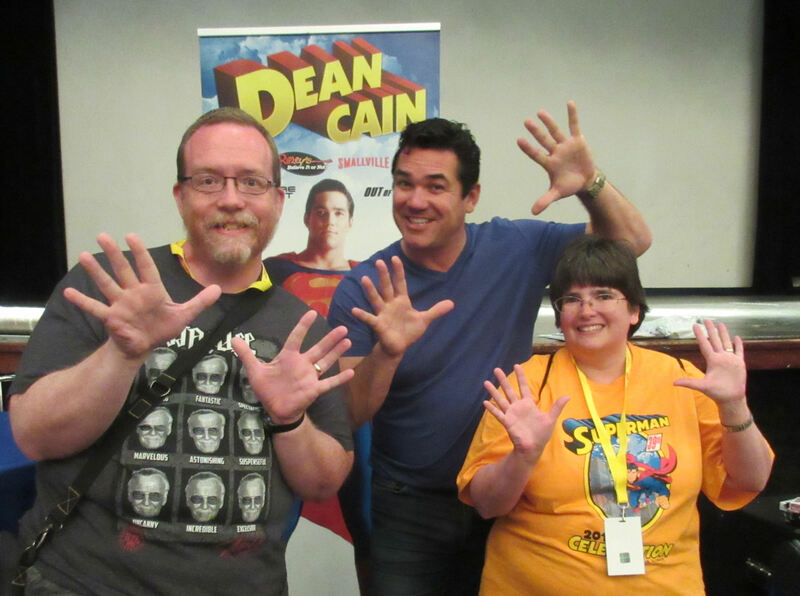 At the Superman Celebration in Metropolis, IL: Dean Cain, one of several good folks we’ve met from The CW’s Supergirl. Y’know, among other famous roles he’s had. 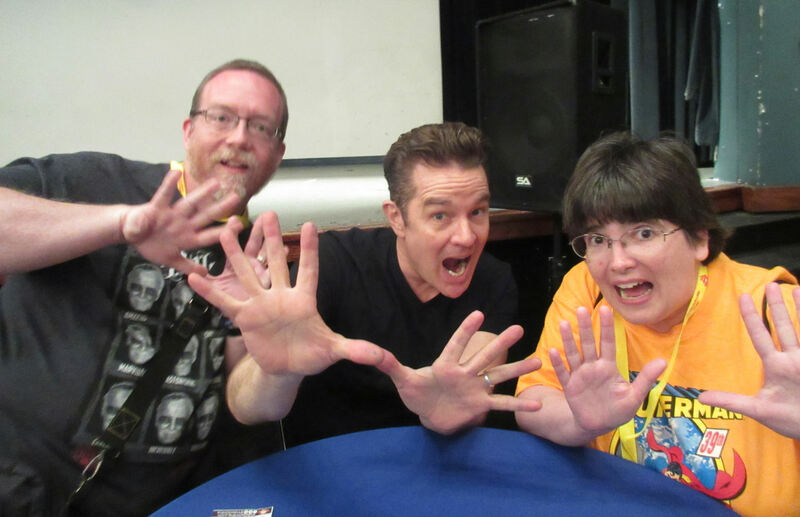 At the next Superman Celebration table over, James Marsters from Buffy, Angel, a little Smallville, and countless other things. 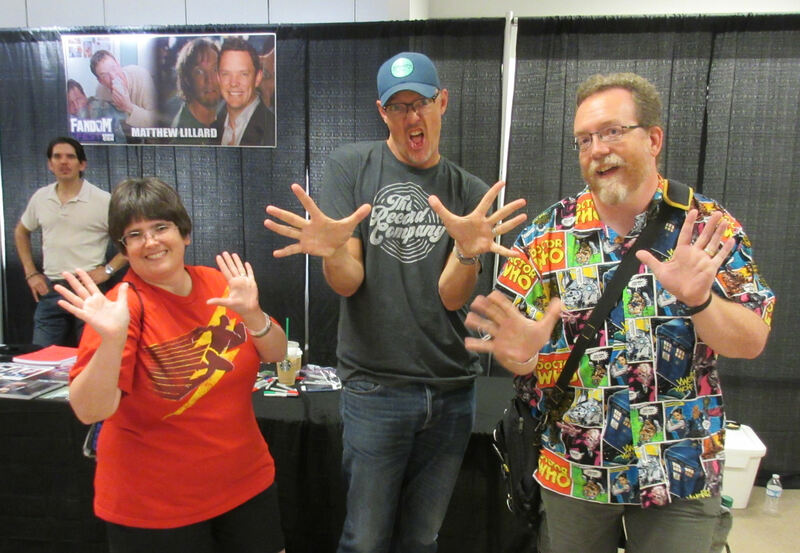 Matthew Lillard, costar of Scream and the Scooby-Doo Cinematic Universe, was one of the few bright spots in the farce that was Fandom Fest. Maybe someday I’ll stop finding reasons to bring that up. P.S. : NEVER FORGET. Same disaster, another bright spot: Desperate Housewives narrator Brenda Strong, known best in our house as Lillian Luthor from Supergirl. This digital version of our botched printed photo was a gift from one of the many kinder folks who worked Fandom Fest. P.P.S. : NEVER EVER FORGET. 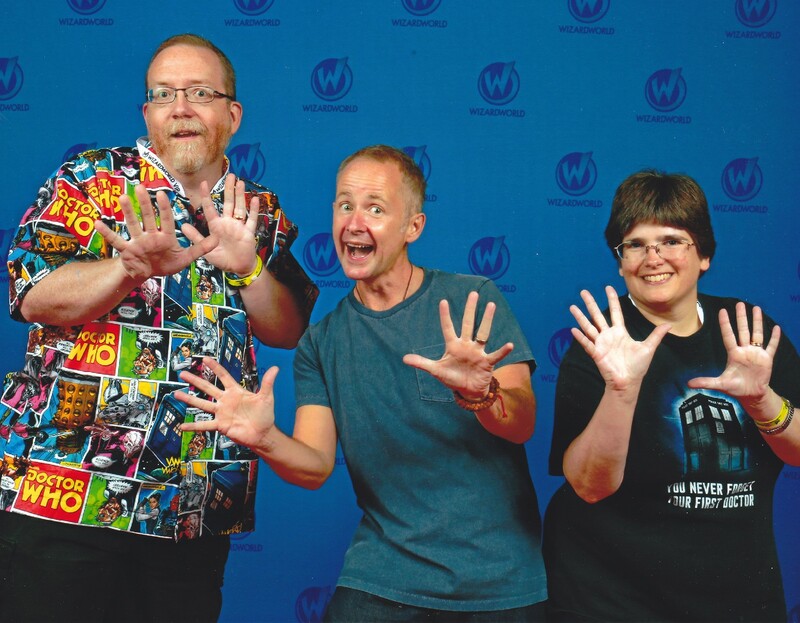 At Wizard World Chicago: the very hyper Billy Boyd from The Lord of the Rings, doing a little “Sauron is dead!” dance. 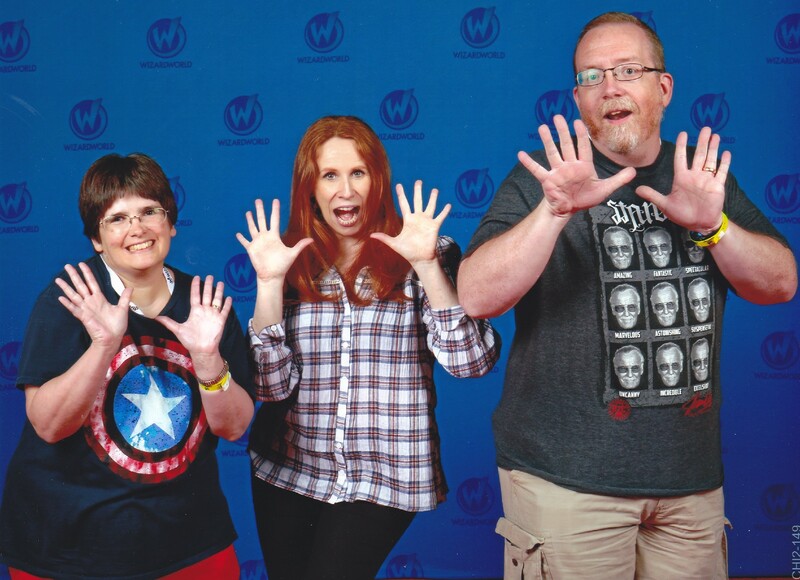 Capping off our Doctor Who trifecta at WWC with the lovely Catherine Tate, also the first actor we’ve ever met from the US version of The Office. 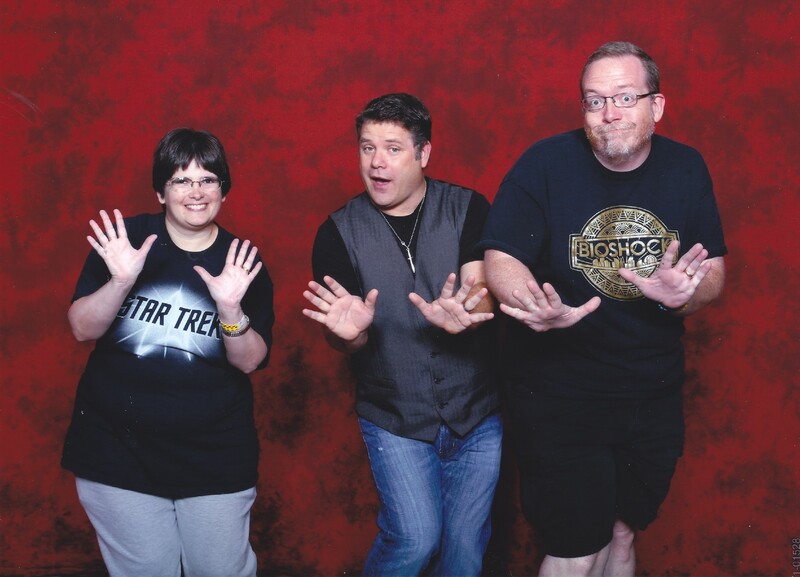 Also a Lord of the Rings survivor, Sean Astin strutted his stuff at HorrorHound Indy a month before his big Netflix moment as Bob Newby from Stranger Things. Astin will be returning to Indy for the next Indiana Comic Con, too. 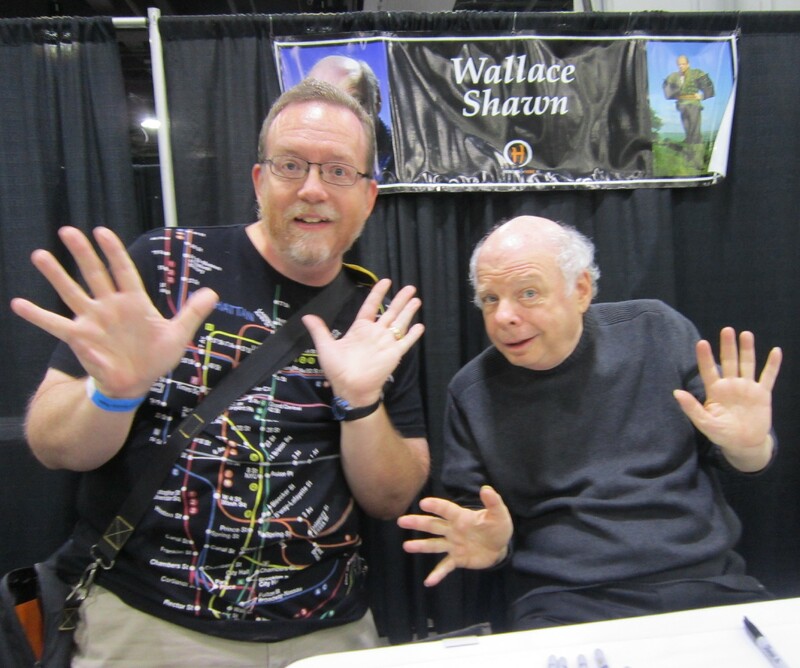 From Cincinnati Comic Expo, headliner Wallace Shawn (The Princess Bride, Toy Story, Clueless, Deep Space Nine, et cetera, et cetera), who’s also scheduled for this year’s Indiana Comic Con. 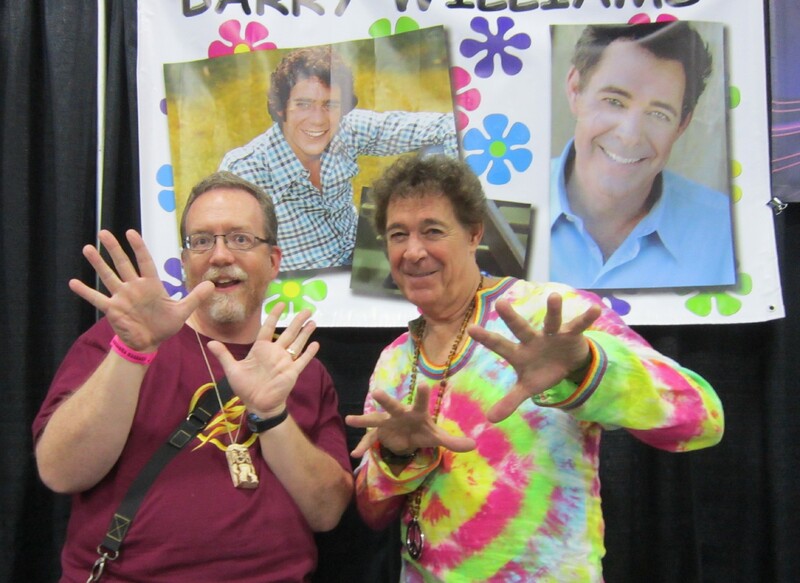 At Fanboy Expo’s Totally Awesome Weekend in Knoxville, TN, our final con of the year: the legendary Barry Williams, a.k.a. TV’s Greg Brady, After his life-changing TV gig ended, he was cast to headline a Broadway revival of Pippin by the Bob Fosse himself. It’s so rare to meet a performer with legitimate jazz hands on their resumé that we had to bow to his firsthand expertise. We have our eye on a few 2018 cons, and hope to commit once we see some updated guest lists. So far this year’s C2E2 is nearly a lock; the rest are wait-and-see for now. Lord willing and funding permitting, we look forward to expanding our odd performance-art photo gallery in the months and years ahead. Until then, happy Pinterest users can check out our complete jazz-hands board to date and try not to snicker too loudly at two fortysomething fans getting out of the house and having a grand old time of it. It’s fun when it’s fun!